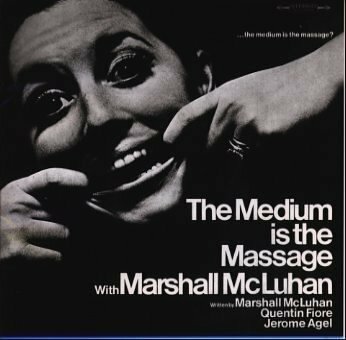 McLuhan's Medium is the Massage is both a book and album published in 1967. It was the first successful "multimedia" production that I'm aware of. While "multimedia" publishing (e.g., CDROM inside the book) is common now, it was unheard of 30 years ago. Both still stand up well IMHO. Unlike previous books which were standard text, this book was a graphic explosion. It has been reprinted by Gingko Press. I found a sample page in an old issue of McLuhan Studies. The album was also pioneering. Unlike Robert Frost reading his poems or a series of songs, each side was one long recording. The album is no longer available but I recent found the Medium is the Massage on mp3 files on ubuweb. I just listen to both (each side is a different mp3) for the first time in probably 20 years. Repeat, Medium is the Massage album is on mp3!